Over the past few weeks, Jane and I have been craving and eating steak weekly and ordered steaks prepared in various ways. Whether the steak is grilled, BBQ’ed, or pan-fried, there’s nothing like devouring a big juicy medium-rare steak. YUM! 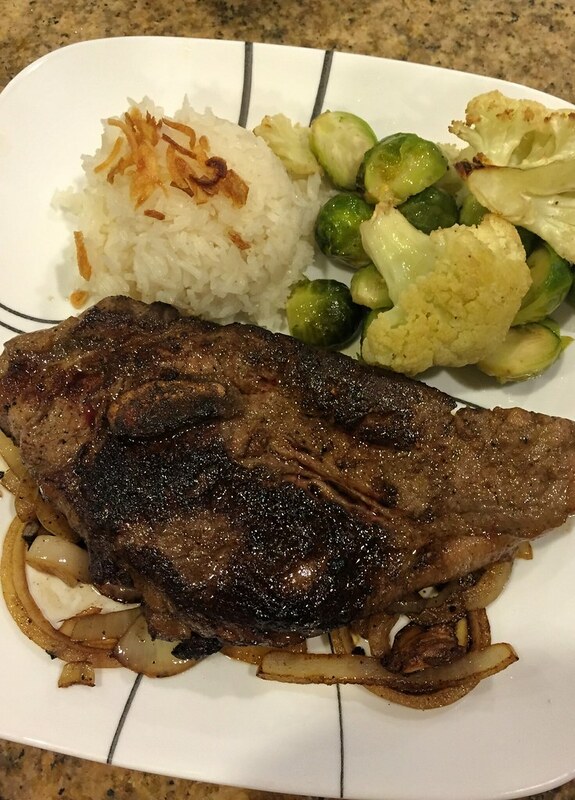 Since Valentine’s day is coming up, I want to share this eazy peazy Vietnamese Style Steak recipe that looks amazing, smells wonderful and tastes great. I simply marinated the steak in Maggi Seasoning sauce, garlic, oil, and pepper and pan-fried on a cast iron skillet and create a nice crust. In a small bowl, mix Maggi Seasoning, oil, pepper, and garlic cloves. Pat dry steaks and in a deep dish or zip lock bag, pour marinade over steaks. Marinade for at least 3 hours. 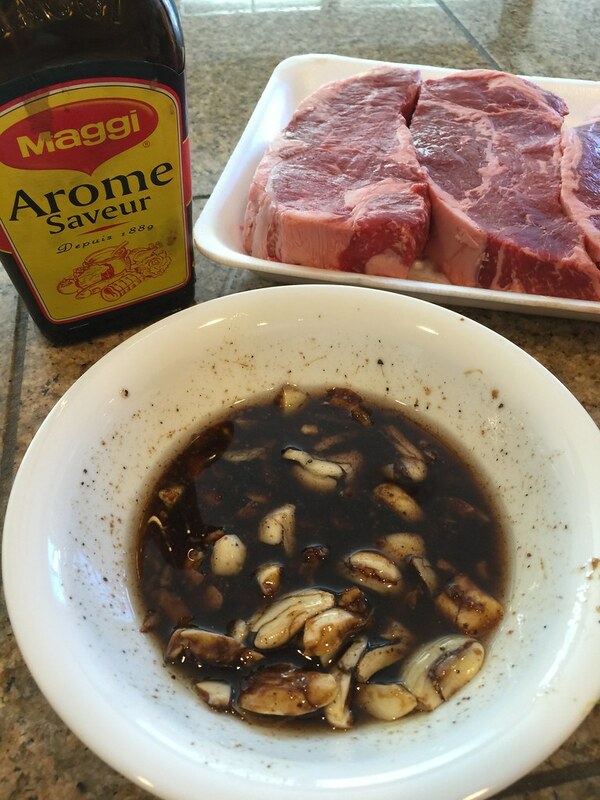 Remove steaks from marinade and pat dry. Flip the steak and continue cooking for about 4 minutes. Add some butter to the pan with about 1 minute cooking time remaining and scoop butter and drizzle on top of the steak. Once steaks are cooked, plate and cover with foil. Reduce the heat to Medium and saute onions in cast iron skillet for a few minutes or until cooked. Plate and serve immediately after onions are cooked. You can substitute regular soy sauce for Maggie Seasoning, although there is a distinct taste to Maggie Seasoning that makes it extra special. I like NY Strip Steak, but any steak cut is fine. Use your favorite kind of steak or what steak you have available.